Yep. That’s it. That’s Obamacare in a nutshell. I first saw this image linked to Obamacare by Twitter user @cuffymeh (#FF) a couple years ago during the 2012 presidential campaign when the first delays and waivers started popping up. I laughed for a good 10 minutes. It perfectly portrays everything about Obamacare in one neat, catastrophic package. The absurdly huge amount of flame represents the massive size of the failure so far. From waivers, to delays, to implementation, to website failures, to coverage gaps, to state rebukes, to ever-sinking poll numbers. It is uniquely appropriate that there are more flames and smoke than train in the photo. While it is, of course, a still photo, the train does have a sense of motion, but it seems like a very sluggish, hampered speed. Obamacare has moved just as slowly and ungracefully. Some of the parts that would eventually become the law started being proposed in 2007 even before the 2008 presidential campaign heated up (pun fully intended). The Treasury Department and Internal Revenue Service announced this afternoon that it will delay enforcement of Obamacare’s employer mandate until 2016 for businesses with less than 100 employees. The employer mandate is a provision of Obamacare that requires businesses with 50 or more full-time employees, defined as someone who works at least 30 hours a week, to offer health insurance benefits or face a punitive, $2,000 per worker tax. The provision was supposed to take effect at the beginning of 2014, as required by statue. Businesses expressed concern about the mandate, and many responded by cutting hours or dropping health benefits. The Treasury Department unilaterally delayed enforcement of the provision last summer, making the announcement in a blog post. The Treasury Department announced today that it is delaying enforcement of the provision for businesses with 50 to 99 full-time employees until the beginning of 2016. “While about 96 percent of employers are not subject to the employer responsibility provision, for those employers that are, we will continue to make the compliance process simpler and easier to navigate,” said Mark Mazur, Assistant Secretary for Tax Policy. On Tuesday, the Congressional Budget Office released its regular report scoring Obamacare’s impact on the budget and economic outlook over 10 years. It fails, of course. Big time. But at least Democrats saw it coming. …a bill that says to someone, if you want to be creative and be a musician or whatever, you can leave your work, focus on your talent, your skill, your passion, your aspirations because you will have health care. Nevermind that someone else will be subsidizing your funemployment. Not only was this loss of 2.5 million jobs over 10 years expected, it was celebrated by Pelosi (and presumably many other Democrats) as a good thing. In an occasionally contentious interview with Fox News host Bill O’Reilly, President Barack Obama defended his administration’s handling of the Benghazi terrorist attacks and the Internal Revenue Service’s (IRS) targeting of conservative groups. He also addressed the Obamacare canceled health plan controversy. O’Reilly began the interview by asking President Obama why HHS Secretary Kathleen Sebelius still has a job in his administration after the initial, disastrous rollout of the federal Obamacare exchange, Healthcare.gov. President Obama repeated the line that no one in his administration “anticipated the degree of problems” on the federal Obamacare exchange website, which isn’t necessarily true, given the warnings from some officials that the website wasn’t ready for launch. Instead, he acknowledge the problems and focused on the fixes applied to the website. From his hilarious ripping of the NSA to pressing Pelosi on why healthcare.gov is such a mess, (to which she replied “I don’t know”) his subtle skepticism about certain government initiatives while believing others to be essential has always puzzled me. It seems obvious that his aversion to concentrated power in the hands of the rich, would be difficult to achieve while entrusting the people they’ve paid to prevent it. Much ink has been spilled in the last few years over the decline of the Blue Dog Coalition in the House of Representatives. Just this week, the Washington Post ran a story noting that this group of purportedly centrist Democrats will has seen its numbers fall from 50 members four years ago. There actually 19 members of the Blue Dog Coalition, though three members aren’t running for reelection in 2014. Reps. Jim Matheson (D-UT) and Mike McIntyre (D-NC), whose districts were targeted by Republicans, decided to retire. Rep. Mike Michaud (D-ME) is running for governor in Maine. Other members of the Blue Dog Coalition face tough bids for reelection, which could further dwindle its numbers at the beginning of the next Congress. The New Republic is only repeating what several Democrats, including Senate Majority Leader Harry Reid (D-NV), have said: Obamacare is a step in the direction of a single-payer healthcare system. The lede in the piece is that Michael Moore got it right when he describe Obamacare as “awful” because it “preserved the health insurance industry preserved the health insurance industry rather than replacing it with a Medicare-for-all style single-payer system.” Like Moore, The New Republic, a far-leftist publication, posits that Medicaid expansion through Obamacare is the key to luring Americans into socialized medicine. Scheiber believes that the same thing could happen with Medicare, the government-run health insurance program for the elderly, surmising that “progressives are likely to get their beloved public option one way or another” in the near future. Since Barack Obama took office in 2009, more Americans say that big government is a much greater threat to the country than big business. 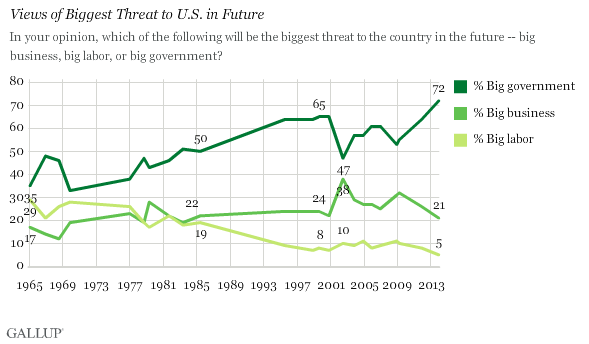 The latest Gallup shows that the number of Americans who believe that big government is the biggest threat to the United States has been increasing in a rather steady fashion. According to Gallup, 72% percent of Americans now believe that big government is the number one threat to the country. The poll also demonstrated that only 21% of Americans now believe that big business is the major issue. The historical high choosing big business over big government or big labor, 38%, was registered in 2002. There are a few ways that a policy gets to be called racist: it is intended to negatively affect one race over another, it results in a negative affect on one race over another regardless of intent, or it has historically been used to negatively affect one race over another regardless of present intent or eventual result. The first two are justifiably used to disqualify certain policies; of course we shouldn’t enact things that are intended to or serve to foster racial discrimination. But the latter is used as a fallacious smear tactic almost exclusively against conservative and libertarian policies. If that’s how we’re going to debate, it’s long past time the historically racist origins of certain liberal policies got considered too. Federalism gets a bad rap obviously because of slavery and Jim Crow laws. The mantle of states’ rights was used for a long time as a means to get away with any number of heinous injustices and atrocities. That is almost never the case today, yet one risks being labeled racist for suggesting it, whether the issue to which federalism is to be applied has anything to do with race or not. Well, if the putative federalist in question is a Republican, that is. Democrats are free to cling to states’ rights when it is convenient without having to worry about similar ad hominem attacks. Even after President Obama’s hailed conversion on the issue of gay marriage, he maintains that states should be free to decide the issue themselves. This is effectively the same position as most elected Republicans, yet he doesn’t get called names because of it. Even the President’s signature health insurance reform grants states tremendous discretion in how much of the law’s new bureaucracy to implement themselves. Has anyone called Obamacare racist? Because ObamaCare is such a complete failure, the president is at least slightly welcoming the latest distraction to keep the masses from noticing that problem. Protestors took to the streets demanding that the government not only increase the minimum wage, but essentially double it. Of course, while that might seem like a nice idea for people that are barely making it by with low wage jobs, it would not work out very well for them in the end. Forbes explored this issue at length a while ago, but their findings remain just as true today. Slight increases in the minimum wage have been shown to cause job losses, as companies downsize to absorb the increased costs of their labor force. One thing that has changed is the effect of ObamaCare on the situation. Many employers are already looking at cutting hours of low wage workers to avoid the increased costs of benefits for employees. Liberals are demonizing this action, and are still demanding higher wages, while ignoring what should be obvious. Increased costs must be paid one way or another, whether by cutting labor costs, increasing prices for consumers, or a combination of the two. Since the latter is a likely solution for many companies that employ low wage workers, that would mean the continuation of a vicious cycle for the very people that liberals would hope to help by increasing the minimum wage in the first place. Low wage workers tend to use the goods and services of companies like fast food restaurants and WalMart, so even if their wages are increased, it probably will not help them very much in the end. A pay raise doesn’t do much good if the price of goods and services goes up, too.